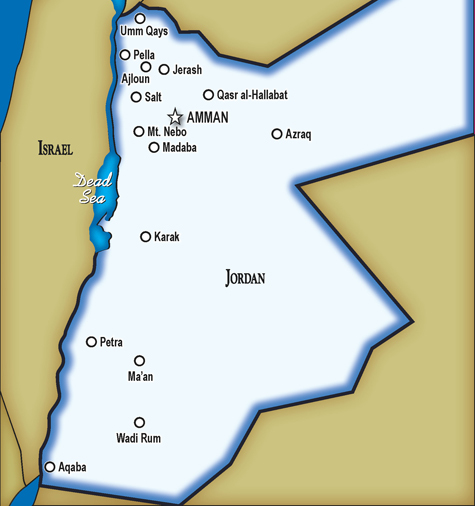 Jordan lies to the east of the Mediterranean sea and just northwest of the Arabian Peninsula. It is bordered in the north by Syria, in the east by Iraq, in the east and south by Saudi Arabia and in the west by Israel and the West Bank. Except for a small stretch on the Red Sea in the very south, Jordan is landlocked. The fertile Jordan valley runs along the western border in the north. The land from the Dead Sea along the central western border and south is quite dry and barren. The central uplands, with their temperate climate and rich soils have steadily attracted settlements for thousands of years. The eastern desert forms over 75 percent of the land of Jordan and is sparsely populated. The government of Jordan is a constitutional monarchy. The current ruler is King Abdullah. The legislative body is the National Assembly which consists of 2 chambers; the 40 member senate, appointed by the king; and the popularly elected 80 member Chamber of Deputies. Jordan is a developing country with increasing industry and foreign investment. Jordan's major export products are phosphates and fruits. Tourism is increasingly significant to the economy with 2.5 million visitors a year. Jordan is mostly Sunni Muslim (96%) with minority Christian and Shi'ite Muslim communities.